Fire Extinguishers are more popular, compared to the remaining Fire Protection Systems. You may identify them as red colour cylinders, seen generally at the doors. Fire Extinguishers come of a variety of types, sizes and for different applications. There are a variety of fires. Each fire type, cannot treated the same way that, is why we have to use different Fire Extinguishers for different fires. For example, a water type Fire Extinguisher cannot be used for an electrical fire. Fire Extinguishers work on the principle that by isolating Oxygen from, the fuel and ignition; the Fire Triangle is effectively broken. Hence, the fire stops immediately. However, Fire Extinguishers are supposed to be used for small fire or fire in an infant stage. For large fires, Fire Extinguishers they might not be useful. So in a sense, you can call Fire Extinguishers as Automatic Fire Extinguishing Systems, useful for fires in their infant stage. But the detection will, remain manual or visual; as seen by the person near the fire. What are the types of Fires? 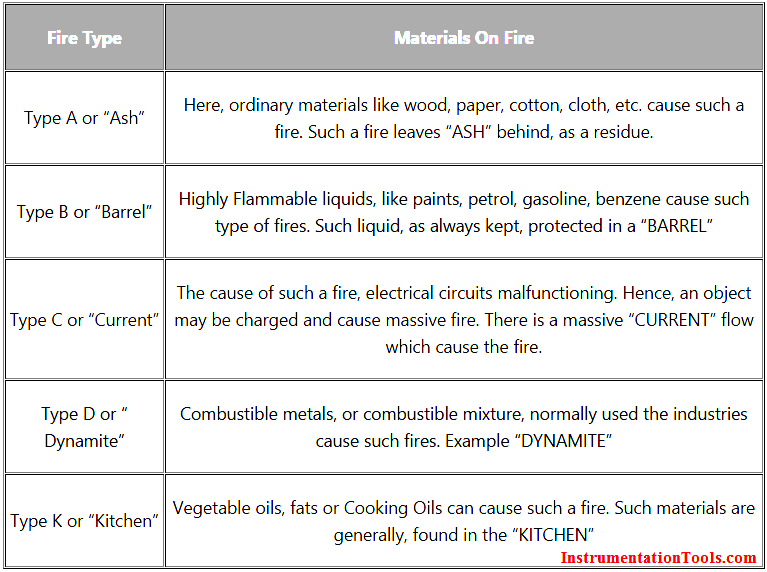 Fires are classified on the basis of their origin or the materials that are causing the fire to burn. 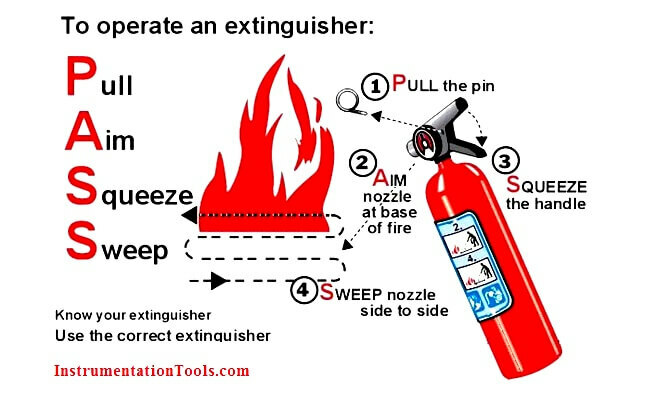 How to operate Fire Extinguishers? 1) P: PULL the pin form the handle. 2) A: AIM the nozzle at the base of the fire. 3) S: SQUEEZE the handle, and don’t let go. 4) S: SWEEP the nozzle from side to side. Water naturally, extinguishes fire. Such a Fire Extinguisher contains water under pressure. Water can be used only against Type A fires. Dry Chemical Type of Fire Extinguishers can be used in a variety of fire types. Hence they are commonly known as “Multi-purpose Fire Extinguishers.” They can be used in Type A, type B and Type C fires. This is the most popular Fire Extinguisher and is commonly seen in offices, hospitals or homes etc. Such a Fire Extinguisher is used in Type A and type B fires. This is a clean type of Fire Extinguisher, this is because it leaves no residue behind. Hence, such a Fire Extinguisher is used in Server rooms or in Art Galleries. Such a Fire Extinguisher is used in Type A and type B fires. After the trigger is pressed, the foam is released from the Fire Extinguisher. The foam floats on the flammable liquid and isolate them from oxygen. However, they leave a residue, which has to be cleaned up. These are generally seen on professional kitchens. They work by forming a mist over the fire, which isolates the Oxygen. Inside, a fire extinguisher is quite like a giant aerosol can, often with two different substances inside. One of them is a solid, liquid, or gassubstance for fighting the fire. The other one is called a propellant and is a pressurized chemical that makes the fire-fighting substance come out when you press the extinguisher handle. Next time you see a fire extinguisher, take a good look. Have you noticed that fire extinguishers are always really strong steel canisters? That because the propellant is stored inside at a high pressure. Strong canisters are needed to stop the extinguishers exploding! A water extinguisher is like a giant water pistol, but instead of using pressure from your finger to fire out the water, it uses pressure from a trapped gas. A ring or pin on the handle stops the fire extinguisher from being set off by accident. It also acts as a tamper-proof seal: if the ring is broken or missing, you know the extinguisher needs to be checked. Inside the sturdy steel case, there’s a canister containing high-pressure gas (orange with blue hashing). Most of the extinguisher is filled with water (blue). A tube runs right up the inside of the tube to a nozzle outside (gray). The nozzle often ends in a piece of bendy plastic so you can easily direct it toward the base of a fire. To operate the extinguisher, you pull the ring and press the handle. Pressing the handle opens a valve (shown here as a green arrow) that releases the pressurized gas from the canister. A jet of water emerges from the nozzle. very nice question and answer very help full.